Here's an experiment I proposed several years back. I have yet to see anyone take this challenge up, so I thought I'd present it (slightly modified to update contemporary references) here again. Is there anything in the original Star Wars trilogy that necessitates any given character being a certain race or gender? I can't think of anything. Obi-Wan and Yoda could have been female. Vader could have been Luke's mother. Even the Han/Leia romance could easily be portrayed by either two men or two women. Everything you think of as masculine or feminine in those movies is strictly a social construct, and it would be no problem at all to do color-blind casting since all ties to what we think of as racial identity are effectively null and void in a galaxy far, far away. That got me thinking about how things are portrayed in comics. (Actually, everything pretty much gets me thinking about comics!) There are a lot of the same types of issues in mainstream comics. So what would happen if you took an existing comic book story -- particularly something really well-known -- and gender/race swapped characters randomly? Any number of fan artists have shown what famous characters might look like if they were gender/race swapped, but that doesn't carry the thought all the way to its natural conclusion. There have been a number of stories where characters were gender-swapped already. 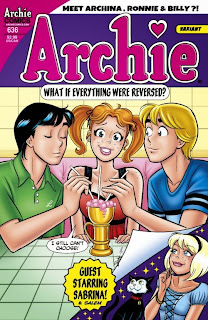 The most famous example I can think of offhand is Archie #636 from several years ago. But, by and large, the writers here (and on the others) were quite conscious of the gender-swapping and specifically wrote the books to that effect. So readers are given a very consciously skewed version of the characters. That's why I'd be more interested to see some existing stories swapped. Keep the dialogue and layouts and everything exactly as they were done originally, but simply swap the specifics of the illustrations themselves. The Galactus Trilogy, The Dark Phoenix Saga, The Killing Joke, The Death of Superman... what would these stories look like if everything were exactly the same, except characters' races and genders were assigned randomly? Again, exact same dialogue, exact same actions, exact same layouts; just swap out the visuals of the character designs. In most race and gender swapping experiments, we're still stuck with preconceptions developed over years, if not decades, of social conditioning of what a person should/shouldn't act like based on their gender or race. Writers and artists, consciously or not, play to those stereotypes and present readers with (typically) one man's idea of what women would be like if they had masculine traits. By eliminating that aspect of the equation, and we pretend the original writer was simply writing from a gender/race neutral position, we can see how those stereotypes are often inadvertently catered to. So here's my challenge. I would like to see someone go through some famous comic story, and randomly assign a gender and race to each character. Then recreate the story exactly as it was originally presented, but using the newly assigned race/gender for everybody. Yup, it would be a lot of work but it would spark one hell of a discussion, one that we haven't had yet!